We’d love your help. Let us know what’s wrong with this preview of Fantastic Voyage II by Isaac Asimov. Deep within Russia, would-renowned scientist Pyotor Shapirov lies in a coma. Locked within his brain rests the key to the greatest scientific advance in the world's history. Only one scientist can hope to locate this secret—Dr. Albert Jonas Morrison, an American. Morrison's mission: to be miniaturized to molecular size along with a team of four Soviet scientists, travel in Deep within Russia, would-renowned scientist Pyotor Shapirov lies in a coma. Locked within his brain rests the key to the greatest scientific advance in the world's history. Only one scientist can hope to locate this secret—Dr. Albert Jonas Morrison, an American. Morrison's mission: to be miniaturized to molecular size along with a team of four Soviet scientists, travel in a specially designed submarine to the dying Shapirov's brain, and tap the secrets held there. Morrison and his companions have only twelve hours to accomplish their task—in the face of unexpected terrors and with their own lives hanging precariously in the balance. To ask other readers questions about Fantastic Voyage II, please sign up. Isaac Asimov once wrote a rather good science fiction adventure novel where five scientists and their submarine are shrunk to the size of a microbe and injected into the body of a comatose scientist. This is not that novel. I am, of course, talking about his novelization of the movie script for Fantastic Voyage, which he was never quite happy with as it wasn't his own book. Instead, this is the novel he wrote 20 years later, with the same basic premise. Unfortunately, it's more than twice as long Isaac Asimov once wrote a rather good science fiction adventure novel where five scientists and their submarine are shrunk to the size of a microbe and injected into the body of a comatose scientist. This is not that novel. I am, of course, talking about his novelization of the movie script for Fantastic Voyage, which he was never quite happy with as it wasn't his own book. Instead, this is the novel he wrote 20 years later, with the same basic premise. Unfortunately, it's more than twice as long as Fantastic Voyage, and while the science may be slightly more solid it also lacks any sense of wonder; the first book (not to mention the movie) was fast-paced and exciting enough to make the plot holes forgiveable, but this one moves like a slug, with the crew bickering every step of the way. The world-famous science-fiction novel has come down with an acute case of sequelitis, which has left it in a brain-dead vegetative state. They send in a microminiaturized team of script-writers to try and operate, but it's hopeless, and the patient dies on the table. The end. Just suppose a patient with a problem inside the brain; what if miniaturization allowed a team of scientists to travel in a sort of submarine to the damaged area? a journey via blood current....it sounds like Nanotech,...and the book showed up back in 1987. Basically a copy of the original story but without as much drama or action. Ottawa & McGill mentioned. Life is one thing—we all lose it sooner or later. Sanity is quite another. Telepathy involved. 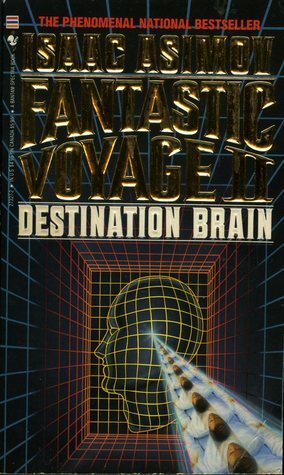 In his introduction to Fantastic Voyage II: Destination Brain, Issac Asimov tells us that he wasn't satisfied with his novelization of Fantastic Voyage and that this novel is an attempt to correct some things he didn't like about the first novel. The result is this book which is less a sequel to the original and more a re-telling of the original story and concept. Asimov tries his hardest to make the concept of miniaturization more scientifically plausible, but it's at the the cost of making the In his introduction to Fantastic Voyage II: Destination Brain, Issac Asimov tells us that he wasn't satisfied with his novelization of Fantastic Voyage and that this novel is an attempt to correct some things he didn't like about the first novel. The result is this book which is less a sequel to the original and more a re-telling of the original story and concept. Asimov tries his hardest to make the concept of miniaturization more scientifically plausible, but it's at the the cost of making the second installment far less interesting and page-turning. The first novel took about half its page length to get the crew miniaturized and inside the human being in question to try and save life. Unfortunately, so does Fantastic Voyage II: Destination Brain. At several points, I found myself muttering "Let's get on with the shrinking already" as our hero, Morrison expresses a sense of trepidation about the procedure he is about to undergo. And it may be with Morrison that this book finds its biggest flaw. Asimov sets up our protagonist as a scientist whose fortunes and favor in the scientific community are on the decline. When approached by a Soviet agent about coming to the Soviet Union to help in an experiment, Morrison is quick to decline, despite the fact that he has no prospects on the horizon in the United States. Even when asked by his own government to go, Morrison declines and eventually has to be kidnapped and taken to the Soviet Union in order to become part of the team. Morrison protests this treatment a lot over the course of the novel. It feels almost like Asimov wants to remind us every ten or so pages that Morrison has become part of this project against his will. This works to the detriment of the book. Part of the fun of the original was no matter who fantastic the situation, the participants were at least enthusiastic about the opportunity to travel inside a human being and possibly save his life. Here the motivation isn't so much saving a life but not allowing a scientist to die without passing on vital knowledge that could make the process of miniaturization easier and more cost effective. Yes, you read that correctly. One of the motivating factors for this journey inside the body of a man and to his brain is to unlock his secrets is entirely budgetary. A good reason, sure. But not exactly one that compels you to turn pages and wonder what will happen next. At least the first novel had the specter of the Cold War hanging over it to drive some of the character and plot motivations. The book also suffers from the same flaw that several later Asimov projects do -- his desire to tie all his universes together. Thankfully it's not quite as egregious as Robots and Empire, but there's a coda that makes Fantastic Voyage II: Destination Brain a stepping stone toward Asimov's Robots and Foundation novels. It's only a couple of pages and it's meant to serve as a coda, so it's a bit easier to overlook and forgive than some of the other examples from the Asimov library, but it's still there. Had I not read the original novel first, I might have liked this one more. Of course, had I not read the original I might not have been willing to give Asimov the benefit of the doubt I needed to keep plowing through this one in the hopes things would get better. Asimov's second foray into miniaturization in a self-proclaimed attempt to satisfy himself by writing a better version than the one based on the original screenplay. In many ways, he succeeded. Set in the middle of the 21st century, it is nevertheless a bit dated by virtue of his use of the Soviet Union as the foil to the United States. Such books are interesting in their revelation of how we believed the Soviet Union would never collapse and would continue to be an enemy of sorts. Asimov, howev Asimov's second foray into miniaturization in a self-proclaimed attempt to satisfy himself by writing a better version than the one based on the original screenplay. In many ways, he succeeded. Set in the middle of the 21st century, it is nevertheless a bit dated by virtue of his use of the Soviet Union as the foil to the United States. Such books are interesting in their revelation of how we believed the Soviet Union would never collapse and would continue to be an enemy of sorts. Asimov, however, depicted a period of relative peace between the Cold War adversaries, albeit a cautious one. Here it is the Soviets alone who have the process of miniaturization, but in Asimov's more capable scientific handling they have an enormous energy problem, and this is the vital bit of information that is being sought by sending a submarine into the brain of a comatose physicist. Many of Asimov's original objections to the idea are addressed. But he has added a layer of SF to it involving telepathy and even tied it, however loosely, to his own universes by mentioning positronic brains and laying the ground---again loosely, very loosely---for what would become the Foundation. I know Asimov hated his novelization of the original Fantastic Voyage movie, given the constraints put on him by the studio, but this near-incoherent mess is much, much worse. The original book at least attempted to make right a few of the plot holes of the movie. This re-imagining of the whole story is disappointing; it's one thing to make sure your science fiction is believable, but when you almost have nothing but scientific exposition to move the story, there's not much fiction to be had. Ad I know Asimov hated his novelization of the original Fantastic Voyage movie, given the constraints put on him by the studio, but this near-incoherent mess is much, much worse. The original book at least attempted to make right a few of the plot holes of the movie. This re-imagining of the whole story is disappointing; it's one thing to make sure your science fiction is believable, but when you almost have nothing but scientific exposition to move the story, there's not much fiction to be had. Adding that together with characters that are complete cardboard stereotypes and an archaic Cold War plotline (even from the time it was written) makes for an extremely dull read. This is not a sequel to Asimov's earlier book, Fantastic Voyage, but rather a re-imagining of that tale. In the first novel, Asimov was constrained by the film script which he was adapting, and he was never entirely happy with the final result. So rather than Fantastic Voyage II, think of this as "Fantastic Voyage 2.0" instead. Set in a near future where the Cold War has ended, but a rivalry between the US and Soviet Union still exists, the story follows an American scientist, Dr. Albert Morrison This is not a sequel to Asimov's earlier book, Fantastic Voyage, but rather a re-imagining of that tale. In the first novel, Asimov was constrained by the film script which he was adapting, and he was never entirely happy with the final result. So rather than Fantastic Voyage II, think of this as "Fantastic Voyage 2.0" instead. Set in a near future where the Cold War has ended, but a rivalry between the US and Soviet Union still exists, the story follows an American scientist, Dr. Albert Morrison, who is forcibly abducted by Russian agents. The Soviets have developed a process that will miniaturize objects, animals and even people, but it is far too expensive to be used for everyday or practical purposes. One scientist believes that the process can be made more affordable, but that man is now lying in a coma, and the secret of affordable miniaturization may go to the grave with him. That is, unless a small team of scientists are willing to be miniaturized, put into the comatose body and retrieve the information directly from his brain. Morrison must come along because he has developed a theory of how to read brain waves and extract information from them. Angry at his abduction and fearful of the miniaturization process, Morrison agrees to join four other Russian scientists and engineers for the trip only under great duress. But the group is distrustful of each other from the start, and tempers flare throughout the voyage. I enjoyed some things about this book better than the original. For one, the science is less rubbery than in the movie. Without the need to visualize his scenarios or provide constant action, Asimov can focus on scientific explanations for miniaturization (and other items) that at least sound a tiny bit plausible. Additionally, the tone of this one falls much closer to a spy thriller, making the relationships between the various characters much more significant. Who is telling the truth? Who is lying? Who can be trusted? The paranoia drives the book forward, even when there isn't a lot of external action. A final plot twist adds another layer of enjoyment to what could have been a completely retread story. On the down side, Morrison's character lacks courage and sometimes even conviction. He spends the first third of the book whining, complaining and trying to find a way out of his predicament. It may be a realistic take on how someone might react to such a situation, but it's dull and makes the protagonist a bit unlikable. Also, it's hard to ignore how far off Asimov's depictions of future US-Soviet relations are. But in 1987, how many people saw the fall of the USSR coming? Considero que esta novela no está a la altura de la mayoría de obras de Asimov. Aunque tiene el característico análisis científico del autor, durante todo el libro, falta el ingrediente más relevante de Isaac Asimov: sus grandes ideas. A diferencia del primer libro, el cual era una obra adaptada del cine, éste ha sido fruto de la total libertad artística del autor. Y a mi pesar, me gustó bastante más "Viaje alucinante I". Se notaba mucha más pasión en esa novela. Sin embargo, el que el autor nos t Considero que esta novela no está a la altura de la mayoría de obras de Asimov. Aunque tiene el característico análisis científico del autor, durante todo el libro, falta el ingrediente más relevante de Isaac Asimov: sus grandes ideas. Pretty enjoyable story. Man is captured and taken into a lab where they try to miniaturize him into one of their scientists who is in a coma. They have some success, but the protagonist believes he has stumbled upon something greater. A good read, not great, but fairly good. Infinitamente superior al primer libro y ni que decir a la película. Un fascinante viaje y una no menos fascinante historia de espías con un final magnifico. The last sentence was the best! Aunque Asimov nunca defrauda no recomendaría yo este libro de entre su extensísima biblioteca, no. This was an interesting read. The thought of humans being able to shrink to fit inside another human is quite intriguing. I found it especially so just with the minimal knowledge of Biology that I could recall. The premise of the book is that an American scientist is taken to the Soviet Union (the book was written well before the thought of the Soviet Union disbanding ever occurred) to help a team of Soviet scientists perfect their miniaturization project. They need the American because he has b This was an interesting read. The thought of humans being able to shrink to fit inside another human is quite intriguing. I found it especially so just with the minimal knowledge of Biology that I could recall. The premise of the book is that an American scientist is taken to the Soviet Union (the book was written well before the thought of the Soviet Union disbanding ever occurred) to help a team of Soviet scientists perfect their miniaturization project. They need the American because he has been working on a program that can detect thought in brains - he has not yet tested it on human subjects. Asimov notes in his prelude that he wrote this book after being a consultant for the movie "Fantastic Voyage", which he did not write. He states he found many inconsistencies and many things that just were not possible to do, so felt the need to write something that was at least scientifically credible. Después de escribir la novelización de la película Viaje Alucinante -un grupo de científicos que se encoge para entrar al interior del cuerpo de otro científico para salvarle de un coágulo cerebral-, Asimov quedó disconforme tanto por lo restrictivo que es el concepto de una novelización como por la ciencia inventada. De ahí el origen de esta novela: reescribir lo que alguna vez escribió de forma más científicamente realista (hasta donde puede ser realista una historia de gente encogiéndose). El Después de escribir la novelización de la película Viaje Alucinante -un grupo de científicos que se encoge para entrar al interior del cuerpo de otro científico para salvarle de un coágulo cerebral-, Asimov quedó disconforme tanto por lo restrictivo que es el concepto de una novelización como por la ciencia inventada. De ahí el origen de esta novela: reescribir lo que alguna vez escribió de forma más científicamente realista (hasta donde puede ser realista una historia de gente encogiéndose). El problema es que la novelización puede haber sido más superficial y simple, pero era mucho más entretenida. En este libro, los personajes tardan la mitad del libro recién en encogerse y, debido a que la reducción de tamaño es presentada en un marco realista, difícilmente puede ser considerado una vista panorámica, ya que los efectos de ser reducidos de tamaño hace imposible ver las cosas del modo normal (tiene que ver con la refracción de la luz y otras cosas que no recuerdo bien), por lo que el viaje es mucho menos pintoresco. La trama también es mucho más cínica que el "viaje alucinante" que era el original. Asimov was an excellent writer, and this book proves it beyond the shadow of a doubt. Albert Morrisons adventure begins when he is approached at a conference by first, an agent of the Soviet Union and then by an agent of the U.S. government, both wanting him to go to Russia to help the Soviets. Though this book deals with the dead Soviet Union, lessons in morality, courage, and the Russian mindset still apply today. Morrison, a discredited neurophysicist, is of course, kidnapped and taken to Mal Asimov was an excellent writer, and this book proves it beyond the shadow of a doubt. Albert Morrisons adventure begins when he is approached at a conference by first, an agent of the Soviet Union and then by an agent of the U.S. government, both wanting him to go to Russia to help the Soviets. Though this book deals with the dead Soviet Union, lessons in morality, courage, and the Russian mindset still apply today. Morrison, a discredited neurophysicist, is of course, kidnapped and taken to Malinkagrad (Russian for "Smallville" where he is introduced to a gregarious, short bear of a man called Dezhnev, a reticent technician named Sophia Kaliinan, and to a colleague, Yuri Konev, all of whom join his kidnapper, a woman named Natalya Boranova, in insisting that Morrison undergo the process of miniaturization. This horrifies Morrison, who steadfastly refuses, even when he finds out the reason - until Boronova blackmails him, by threatening to send him back to the U.S.
Grandioso seguito di "Viaggio allucinante", qui un Asimov senza i confini che gli erano stati imposti sulla lavorazione del sopra citato per via della sceneggiatura del film già in lavorazione, ne esce un libro molto più coinvolgente e meglio strutturato probabilmente. Personalmente amo il "buon Dottore" in ogni sua forma e questo probabilmente pregiudica il mio spirito critico ma la sua capacità di raccontare la fantascienza in termini semplici e tuttavia credibili, è talmente disarmante che non Grandioso seguito di "Viaggio allucinante", qui un Asimov senza i confini che gli erano stati imposti sulla lavorazione del sopra citato per via della sceneggiatura del film già in lavorazione, ne esce un libro molto più coinvolgente e meglio strutturato probabilmente. Personalmente amo il "buon Dottore" in ogni sua forma e questo probabilmente pregiudica il mio spirito critico ma la sua capacità di raccontare la fantascienza in termini semplici e tuttavia credibili, è talmente disarmante che non si può fare altrimenti. La storia è quasi la stessa di "Viaggio allucinante", degli scienziati che saranno miniaturizzati per entrare in un corpo umano e più precisamente nel suo cervello per dare vita ad una avventura fantascientifica che farà correre la fantasia in maniera molto intelligente, menzione speciali poi per le righe finali, geniali. Atmosfere cupe, un eroe che stranamente sembra un antieroe e ben poca della leggera ironia del solito "dottore". Unico punto debole, probabilmente l'incipit che sicuramente poteva scorrere piu' spedito; di contro la caratterizzazione dei personaggi e' molto ben fatta cosi' come l'ambientazione, accattivante e non convenzionale. Da leggere insieme a "Viaggio allucinante". Romanzo gradevole, con tutti i pregi e tutti i difetti di Asimov. Tra i pregi sicuramente c'è la trama, molto più solida e convincente rispetto al predecessore. Personaggi stavolta ben costruiti, con psicologie meno "tagliate con l'accetta". Tra i difetti, la solita "straripanza scientifica": nella parte centrale del romanzo, quella del "viaggio fantastico" all'interno del corpo umano, il buon Dottore si dilunga spesso e volentieri in spiegazioni fisiche e biologiche, per giustificare questo o que Romanzo gradevole, con tutti i pregi e tutti i difetti di Asimov. Tra i difetti, la solita "straripanza scientifica": nella parte centrale del romanzo, quella del "viaggio fantastico" all'interno del corpo umano, il buon Dottore si dilunga spesso e volentieri in spiegazioni fisiche e biologiche, per giustificare questo o quell'aspetto della trama e per dare un senso compiuto ad ogni singola mossa dei personaggi e della loro nave. Questo aspetto, secondo me, alla lunga stanca il lettore, lo annoia. Va bene cercare il realismo massimo e l'aderenza alla realtà, ma Asimov si lascia prendere la mano. Le parti più scorrevoli infatti, sono l'inizio e la fine, quelle guarda caso che fanno da contorno al viaggio vero e proprio. Interesting enough read, if a little didactic and not to be taken too seriously. Its main problem is the problem of so many other stories where a genius (or multitude thereof, as in this case) is the main character. The big twist at the end was entirely foreseeable. In fact, when (the lauded even by other characters as the most genius genius ever to stalk the earth) Konev burst into his superior's room near the end of the book, all aflutter at plot and consequence, all I could think was "I figure Interesting enough read, if a little didactic and not to be taken too seriously. Its main problem is the problem of so many other stories where a genius (or multitude thereof, as in this case) is the main character. The big twist at the end was entirely foreseeable. In fact, when (the lauded even by other characters as the most genius genius ever to stalk the earth) Konev burst into his superior's room near the end of the book, all aflutter at plot and consequence, all I could think was "I figured this out 100 pages ago, you stupid disagreeable man." Come nel famoso Viaggio Allucinante, il romanzo e il film che descrivono il viaggio di un sottomarino miniaturizzato all'interno del corpo umano, anche questo inatteso seguito di Isaac Asimov ci porta di fronte a un problema quasi impossibile non solo per la fisica, ma anche per la biologia. Viaggiare nell'infinitamente piccolo che costituisce l'organismo dell'uomo e avvicinarsi addirittura al suo cervello sembra un'impresa assurda: ma Asimov vi si è cimentato ancora una volta con un gusto del paradosso e dell'avventura che sono degni di lui. Non per nulla è stato professore di biochimica in una facoltà di medicina e non per nulla ha deciso di abbandonare quella professione per mettersi a scrivere avventure emozionanti come quella di Destinazione cervello. Not at all happy about the novel/screenplay written for the movie Fantastic Voyage, Asimov reinterprets the subject of a miniaturized human-manned expedition inside the human body, adding some of the “realistic” details that he found missing in the first work. The adventure will not suffer from the newly added details, on the contrary: as the author decides to acknowledge the previous work, self-mockery based comedy will ensue, giving the reader an honest fun ride! This was my first full-length Asimov book (having read a dozen or so of his short stories) and I was pleasantly surprised that the quality I came to expect of his short stories was very much present here as well. It's a thrilling story, and the scientific accuracy of his writing remains remarkably true even after nearly three decades. Much like 'The Last Question', the conclusion of the book was immensely satisfying and memorable.